"New Jersey's Most Important Muralist" - Who Was Who in American Art. 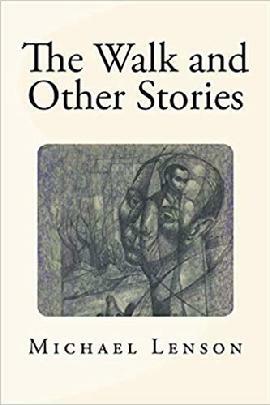 We are pleased to announce that a new edition of The Walk and Other Stories, a book of short stories by Michael Lenson, has just been released and is available on Amazon.com as both a paperback and an eBook. Click on the book cover to the left to order. 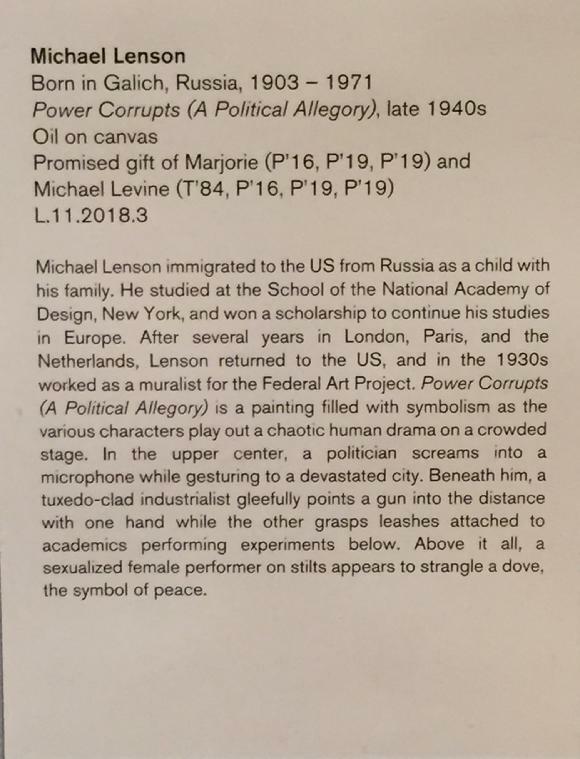 We are delighted to report that "Power Corrupts: A Political Allegory" by Michael Lenson is currently on display at Duke University's Nasher Museum's current exhibition, Art of the United States: 1930-1960. 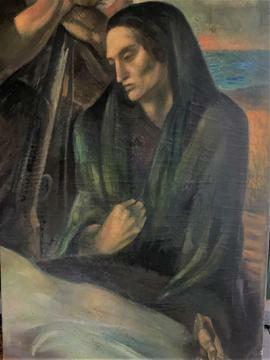 This important painting dates from the early 1940s. We are even more pleased to announce that this painting is now part of the Nasher's important collection of American art. In case you can't make it to the Nasher to see this important exhibition, we are pasting in below an image of the wall label that is posted by the painting. We are delighted to report that the Wolfsonian Institution in Miami Beach (a division of Florida International University) has just added two Lenson mural fragments to its permanent collection. 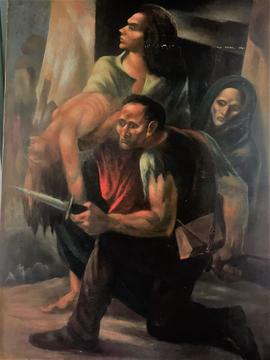 They depict scenes from the Spanish Civil War and incorporate the same imagery that Lenson created for a series of lithographs that he completed in the 1930s that were sold to raise funds to support the Republican forces that were battling Generalissimo Franco. "The Wolfsonian uses objects to illustrate the persuasive power of art and design, to explore what it means to be modern, and to tell the story of social, political, and technological changes that have transformed our world. It encourages people to see the world in new ways, and to learn from the past as they shape the present and influence the future." The artist would have been thrilled to have these two powerful works arrive at the Wolfsonian which, incidentally, owns five other Lenson works, including a full-size working drawing of his mural "Mining" which he created for the U.S. Post Office in Mount Hope, West Virginia. Other institutions that own Lenson works include The Butler Institute, The Jersey City Museum, The Johnson Museum of Cornell University, The Maier Museum of Art, The Montclair Art Museum, The Newark Museum, The Noyes Museum, The Princeton University Art Museum, The Rhode Island School of Design and The Smithsonian Institution. This is what happens when two art collectors acquire a Lenson and then design a room around it! We just wanted to show you how spectacularly well it all worked out - for the collectors, for their home, and for the Lenson work, which dates from the late 1940s. In 1960, Michael Lenson took a sabbatical from painting and wrote The Walk and Other Stories, a collection of illustrated autobiographical short stories that are modeled on incidents from his own life. We are pleased to announce that the collection is now available as a Kindle edition. CLICK HERE to order now. If you are fascinated by this artist - and why shouldn't you be? - you will want to download a copy. 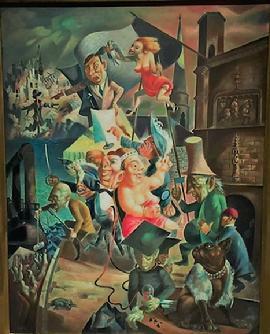 Lenson's immense 1936 murals in the cafeteria of the Essex Mountain Sanatorium in Verona, New Jersey, were destroyed many years ago. But now they have come to life again, thanks to a new book by historian Richard Kennedy about the Sanatorium and its history. The pictures of the mural that you'll find in this book are about the best anywhere. CLICK HERE to visit the Amazon.com ordering page for this wonderful new book. Catalog of Lenson's Recent Exhibition at the Butler Institute Is Now a Kindle Edition! We're pleased to announce that the complete catalog of Lenson's recent exhibition "Time, Place and Substance" is now available as a Kindle book. CLICK HERE to order your copy now. We are thrilled to report that Michael Lenson was inducted into the Nutley Hall of Fame on November 17th, 2013! Nutley is the suburban town where he lived and painted between 1941 and his death in 1971. Reginald Marsh, Charles Hawthorne, and many other important American artists lived and painted in Nutley too.